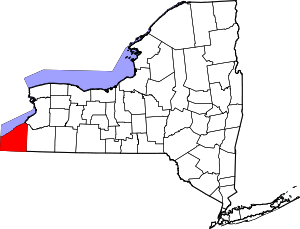 This is intended to be a complete list of properties and districts listed on the National Register of Historic Places in Chautauqua County, New York, United States. The locations of National Register properties and districts for which the latitude and longitude coordinates are included below, may be seen in a map. There are 45 properties and districts listed on the National Register in the county, including 2 National Historic Landmarks. (#83001647) 90 W. Main St.
(#74001223) 4 N. Maple St.
(#96000133) Jct. of Main St. with Lake and Highland Aves. (#83001648) 145 S. Portage St.
(#03000045) 211-217 W. Second St.
(#72000824) 68 S. Main St.
(#78001843) Main, Temple, Church, Day, and Center Sts. (#83003895) E. Main and Portage Sts. (#14000935) 23-28, 20-408 N. Main, 200-322 Washington, 201-326 Cherry, 207-317 Pine, 215-417 Spring, 8-21, 100-200 E. 4th Sts. (#83001652) 79 N. Portage St.
(#83001653) 232 W. Main Rd. (#83001654) 119 W. Main St.
(#96000521) Roughly bounded by NY 430 and Chautauqua Lake between Lake and Leet Aves. (#92000068) Jct. of E. Lake Shore Dr. and N. Serval St.
(#83001657) 118 W. Main St.
(#83001658) 101 N. Portage St.
(#09000629) 101-103 W. 3rd St. and 215-217 Cherry St.
(#83001659) 233 E. Main St.
(#83001660) 309 E. Main St.
Wikimedia Commons has media related to National Register of Historic Places in Chautauqua County, New York. This page was last edited on 31 July 2018, at 00:52 (UTC).